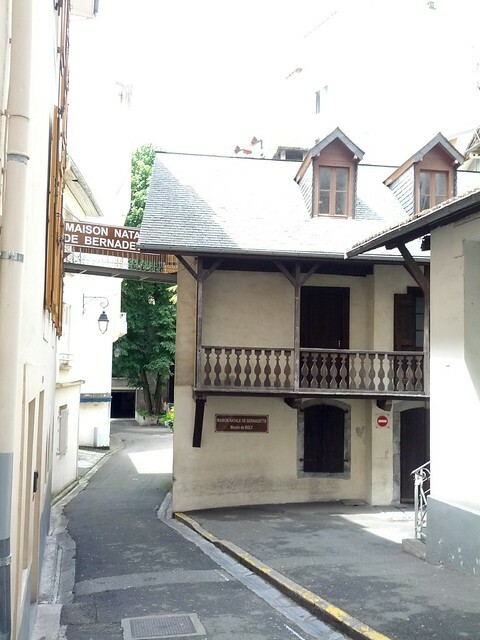 St Bernadette was born at the Boly Mill in Lourdes (above) where her father, Francois Soubirous earned a modest living, providing flour for the local bakers. Pilgrims are shown round this site and the Cachot, formerly a prison cell, where the family had to live for a while after Francois Soubirous went out of business. They learn that the family was destitute, that he was unjustly accused of stealing, that the little hovel was scarcely fit for human habitation and so on. Although not explicit, there is a hint that the father was responsible for the family’s misfortune. A detail which had not struck me before was that the father’s modest business folded because of Government intervention. To be fair, it was a benign intervention; there was a famine and the authorities arranged for free grain to be distributed. The failure of the small business of a local miller was, I suppose, collateral damage. Nevertheless, the incident is a lesson for us. When Christians make political demands for market intervention, including the radical intervention of giving away free stuff using taxpayers’ money, small businesses should not be neglected. Whether it is millers, local farmers or fruit sellers, local businesses owners are people too, and if their enterprise is small enough, they may not have the strength to recover once the market intervention ceases. My thoughts on this subject have been influenced by reading Michaela Wrong’s “It’s Our Turn to Eat” and Dambisa Moyo’s “Dead Aid: Why aid is not working and how there is another way for Africa.” I am not an economist and don’t claim that either has the last word on the question of foreign aid in Africa, but their passionate criticism of foreign aid does at least deserve a hearing from priests and bishops who feel inclined to wade into debates about exactly how we should use our resources to assist developing countries.